This high-performance mixer leverages LTCC, semiconductor technology, and patented circuit techniques to achieve low-loss upconversion for WiMAX systems. The 2.5 to 2.7 GHz band is already available for mobile and fixed wireless services in the United States. This band is also currently underutilized and potentially available in many countries throughout South America and Europe as well as some countries in the Asia-Pacific region. The 3.3 GHz and 3.5 GHz bands are already allocated for fixed wireless services in many countries worldwide and are also well-suited to WiMAX solutions for both fixed and mobile services. Mini-Circuits has developed up/down converter mixers for those bands. There are various small bands in the frequency range of 5.15 to 5.875 GHz which are also used for WiMAX. A new mixer SIM-U712H+ is now available for such applications. The mixer bandwidth is wide enough to make it useful for other applications such as line-of-sight links and radar. Mini-Circuits model SIM-U712H+ is an upconverter mixer and is based on a combination of low-temperature--cofired-ceramic (LTCC) technology, semiconductor technology, and a highly manufacturable circuit layout. The patented combination results in small size, high insensitivity to electrostatic discharge (ESD), excellent stability with temperature, and high IP3. Figure 1. The SIM-U712H+ surface-mount mixer is ideal for upconverting signals in the 2600-7100 MHz band. The SIM-U712H+ mixer (Fig. 1) is built on an LTCC substrate, ideally suited for designs with multilayer circuits. In contrast to conventional planar circuit designs, in which all circuit elements are placed on one side of a single-layer printed circuit board, LTCC circuits can be designed and fabricated in three dimensions, even with embedded components between layers to save space. The approach results in a mixer that measures just 0.2 x 0.18 x 0.087 in. (5.1 x 4.6 x 2.2 mm), which is smaller than some commercial semiconductor-based mixers. And, although the SIM-U712H+ mixer incorporates semiconductors to accomplish its nonlinear frequency-translation function, it is a passive design that operates without DC bias (compared to a standard semiconductor or integrated-circuit mixer which requires the application of constant DC bias). The SIM-U712H+ is a double-balanced mixer (Fig. 2) built around a reliable diode quad. Except for the diodes, the entire structure is implemented in multiple layers of LTCC which is inherently hermetic. By integrating components in LTCC, the mass of the mixer is minimized, making it extremely rugged in terms of withstanding shock and vibration. In fact, the entire mixer structure can withstand the environmental extremes usually associated with tough military components, in terms of temperature, humidity, vibration, and mechanical shock. Figure 2. The SIM-U712H+ double-balanced mixer employs a diode quad with patented circuit techniques and proven LTCC circuit materials for stable, high-ESD-immunity performance. The mixer is RoHS compliant, constructed without lead-based solder or other hazardous materials. It is also built to withstand severe ESD scenarios under conditions normally hazardous to monolithic semiconductor mixers. The SIM-U712H+, like other members of the company’s SIM mixer line, meets Class 1C ESD requirements, a level of 1000 V when tested under the Human Body Model (HBM) conditions (compared to standard semiconductor mixers which are typically rated as Class 1A, 250 V for HBM testing). The SIM-U712H+ mixer also meets Class M2 ESD requirements (testing at 100 V according to the ESD Machine Model). The SIM-U712H+ mixer accepts intermediate-frequency (IF) signals from 2600 to 7100 MHz and local-oscillator (LO) signals from 10 to 1780 MHz at a nominal level of +17 dBm to produce RF output signals from 2600 to 7100 MHz (well in excess of the WiMAX-band range). 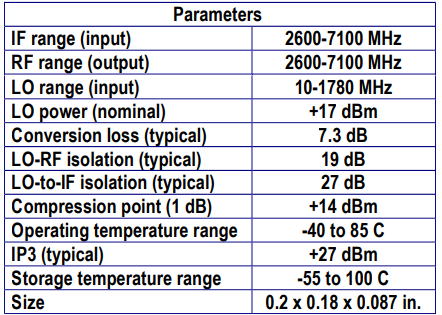 It performs the frequency upconversion with typical conversion loss of 7.3 dB (see Table I). The mixer’s conversion loss is very well behaved with frequency even at other LO drive levels. 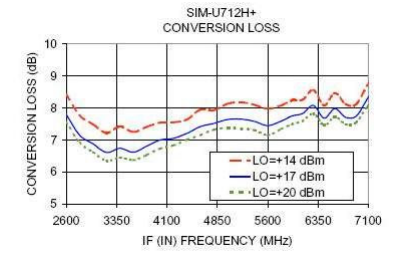 For example, the SIM-U712H+ was tested with LO drive levels of +14, +17, and +20 dBm and exhibited very consistent conversion-loss profiles across the 2600-to-7100- MHz RF output range (Fig. 3). Performing swept-frequency testing at different LO drive levels simulates the effects of variations in LO power from unit to unit as well as across wide frequency ranges. The variation with LO drive power is typically +0.6/-0.2 dB across the 4500-MHz measured bandwidth. Figure 3. The SIM-U712H+ mixer exhibits well-behaved conversion loss performance with frequency over a wide range of LO drive levels. It was tested here at LO drive levels of +14, +17, and +20 dBm. 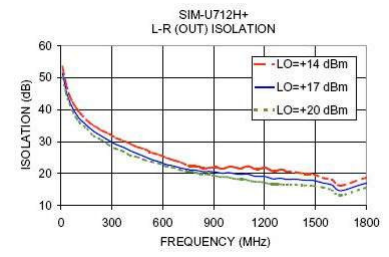 The LO-to-RF isolation of the SIM-U712H+ mixer was also evaluated at the three LO drive levels used for the conversion-loss tests, to compare performance at different LO levels and to understand the effects of variations in LO power on isolation. As seen in Fig. 4 the isolation between the LO and RF ports was measured at typically 50 dB at 11 MHz and 16 dB above 760 MHz for the three LO drive levels of +14, +17, and +20dBm. Variations in isolation as a function of LO power are typically ±2 dB. Figure 4. The isolation between the LO and RF ports was measured at typically 50 dB at 11 MHz and 16 dB above 760 MHz for the three LO drive levels of +14, +17, and +20 dBm. Similarly, the LO-to-IF port isolation was also evaluated at the three LO drive levels. While isolation between these two ports is less critical in an upconverter application (where a greater concern is feedthrough of LO signals to the RF output port), the SIM-U712H+ mixer nonetheless exhibited typically 67 dB at 11 MHz and 18 dB above 900 MHz for the three LO drive levels of +14, +17, and +20dBm (Fig. 5). Variation with LO power is negligible. Since wide dynamic range is important in many ISM-band applications, the input third-order intercept point (IP3) of the SIM-U712H+ mixer was also evaluated at the three LO drive levels (+14, +17, and +20 dBm) and an IF input range of 2600 to 7100 MHz. The mixer’s input IP3 is typically about +27 dBm across most of the range (Fig. 6). Figure 6. 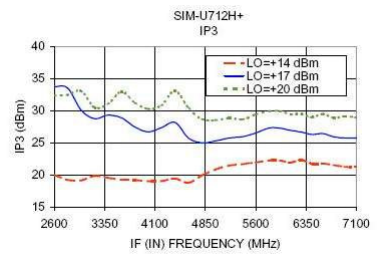 The measured input third-order intercept performance of the SIM-U712H+ mixer is typically +27 dBm at 17 dBm LO. The LTCC double-balanced mixer features typical LO VSWR of 1.9:1. The VSWR of RF port is 1.8:1 dB typical in the WiMAX band of frequencies while the return loss at the IF port is typically 2.2:1 across the full IF band. For WiMAX applications the SIM-U712H+ double-balanced mixer provides an extremely compact, high-performance solution based on a stable LTCC process. The mixer supports conventional surface-mount applications, and can be supplied in tape-and-reel formats for use with automated assembly equipment. The RoHS-compliant mixer fills a wide range of global WiMAX applications and is designed to withstand high levels of ESD mishandling compared to more sensitive, and often larger, semiconductor mixers. This RoHS-compliant mixer is designed to withstand high levels of ESD mishandling compared to more sensitive, and often larger, semiconductor mixers. Mini-Circuits’ LTCC mixers have been tested extensively and qualified for environmental conditions such as humidity, thermal shock, and vibration. To evaluate the durability and reliability of their solder joints, 20 of the LTCC mixers were soldered onto FR-4 PCB motherboards and thermally cycled (1000 cycles) over the operating temperature range of –40 to 85ºC. The DC continuity was measured from the motherboard trace to the top of the LTCC board, with no failures found.